If you were online last week, you probably heard the story about how the George Orwell Estate supposedly had issued a takedown to CafePress for some T-shirts made by a guy named Josh Hadley that merely showed the year "1984" on them. I first saw it when someone pointed me to Hadley's Facebook post about it, in which he's quite reasonably angry. This was the T-shirt image that Hadley said was taken down: Something about this seemed weird, so I reached out to everyone involved -- Hadley, Bill Hamilton (the literary agent who manages the Orwell Estate) and CafePress. While I was talking to all of them, the story exploded with stories in TorrentFreak, Consumerist and a number of other places, all attacking the Orwell Estate for such a (dare we say it?) Orwellian takedown. Clearly the image above is not infringing anything from Orwell's estate. The simple year "1984" is not infringing in any way. But it didn't stop the takedown from happening... and from people angrily piling on against the estate. It took a while to get the complete story, and Hamilton was bizarrely reticent to share the details of what happened with me, other than to insist he did not send a takedown for that T-shirt, but rather for a mug that he insisted was "obviously infringing." I kept asking for the specific takedown, saying we'd be happy to put up a story showing that he was blameless, but he refused to share it. CafePress was similarly slow to respond -- and eventually would do nothing more than say "no comment." Eventually, we were able to get a copy of Hamilton's original takedown message, which was a bit vague, and just discussed a photograph of Orwell that another account was using, and some extensive quotes that were made to look like "official" licensed merchandise -- such that the takedown was a slightly vague combination trademark/copyright/publicity rights takedown. Your Orwell merchandise has been brought to my attention as the literary executor to the Orwell estate, responsible for all licensing and copyright. The Orwell estate does not license merchandise, and the quotes you use and the photograph of Orwell are in breach of copyright. Please remove from sale immediately. I look forward to hearing by return. Yes, the takedown message is a bit vague (Moore, if you're wondering -- whose first name is actually Lindsay, not Lindsey -- is CafePress's intellectual property agent). An official DMCA takedown notice requires the specific identification of what is infringing, and Hamilton's note fails that test. The proper thing for a company to do is to reject the deficient notice, and let the sender know that they need to file a compliant takedown notice. 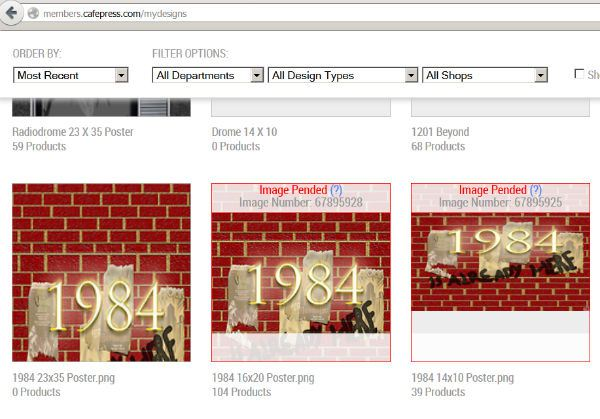 CafePress did not do that, and apparently just started taking down Orwell/1984 products at random. However, it does appear that the target was not Hadley's T-shirts, but rather than actually assessing whether or not anyone's rights were violated CafePress just went on a crazy takedown binge and pulled down what appears to be anything even loosely connected to Orwell/1984. And Hadley's T-shirts got caught in the crossfire. And then CafePress refused to admit it made a mistake. Unfortunately, this is not the first time we've written about CafePress overreacting and taking down lots of stuff over which there was no legitimate takedown. The whole situation seems rather ridiculous, and even worse is that CafePress sat there and let the Orwell Estate take the heat for its actions. It seems that, once again, if you're looking for a print-on-demand partner, CafePress is not your best choice. While many have reported on this story as the Orwell Estate being Orwellian, the truth here seems more like CafePress being Kafkaesque. "this is not the first time we've written about CafePress overreacting and taking down lots of stuff"
Well maybe CafePress should lay of the coffee for a while, they won't be so hyperactive then. Re: "this is not the first time we've written about CafePress overreacting and taking down lots of stuff"
Maybe if they became DecafePress! Well Cafe Press did go all Kermit the amphibian on this the estate did pull a Miss Porcine with the original volley and does deserve the roasting they are receiving. Given the insanity that is copyright/ip CafePress's response is about average. How broken is the system when an obviously flawed notice is just accepted because the penalty only applies to 1 side. CafePress screwed up in going above and beyond, but clearly the rightsholder failed to deliver a proper notice. CafePress letting the Estate (I do hope these recent takedowns encourage him to write more now) take the heat is them doing the best they can to avoid owning responsibility. Which do you think matters more to the business model, protecting your non-infringing stuff or keeping the business open? While a lawsuit against CafePress might not succeed, bleeding them of cash until they fall is a time honored tradition in litigation. "... and the quotes you use... are in breach of copyright." So actually, it sounds to me like the Orwell estate was in fact claiming (or at least very strongly implying) rather more than they're actually entitled to. The estate made a blanket statement without identifying the actual allegedly infringing works, so CafePress identified everything that could remotely be considered Orwell IP and went wild. Even by the most generous reading of the law over takedowns, not identifying the specific work makes it defective. When you just demand a 3rd party decide what you have rights to, you end up with idiocy like this. I would have assumed that for any quote that fits on a mug, t-shirt, etc, (probably even a poster) that use would be fair use, anyways. But that is where we take a turn into the uncharted wilds, fair use is in the eye of the beholder. And the liability for the platform is huge, so they nuke form orbit. Then the person who "runs" the store, has to engage in the fight in a process heavily weighted to copyright holders. One need only look at the "Dancing Baby" case to see how much fun that task can be. There is no downside to overreach on claims, doubling down when you are wrong, and so much more. There are huge downsides for platforms who don't jump high enough and for users fighting against a system that refuses to be fair.